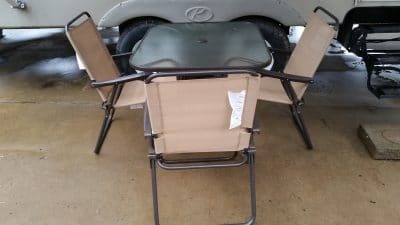 I was looking for a small portable set for my patio in front of my Camper. This Six piece Searcy Creek Mainstays Outdoor Dining Set was my choice. If you have a small area that you do not want to leave your Table and Chairs out in, this set is very portable and easy to store. Lets see what I got and see if it will work for you. Table has a smoked tempered glass top that is supported by four legs with a center support brace. 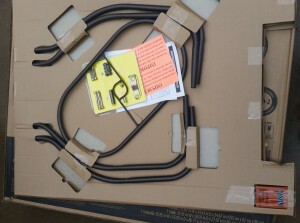 The metal parts have a brown powder coated finish. Once put together it is very stable. Has hole in middle of table for umbrella. Comes with cap if you do not want to use umbrella. The table is 38 inches long, 32 inches wide and 28 inches tall. This set will include four metal framed chairs with a canvas fabric. The metal has a powder coated finish to let it last longer in the outdoor weather conditions. Fabric is vented and is very comfortable for casual sitting. Each chair is rated for 200 pounds of capacity. Each chair is 24.5 inches wide, 35 inches tall and 22 inches deep. They will fold for storage when not in use. I fold and store them on top of my table in a shed when not at my weekend home. The umbrella is four sided with a snap lock when extended, it is either up or down no other settings. The same fabric that covers the chairs is use on the umbrella. 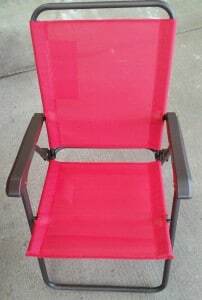 Has a two piece pole that is powder coated the same color as the table and chair metal parts. When extended the umbrella is 56 inches across and 81 inches tall. I can walk under it without any problems. When you open the box you will find the chairs strapped together in pairs with a plastic strap. The glass top for the table is inside another box for protection. The legs and shelf are attached to this box. The tools, instructions and hard ware are under the shelf. 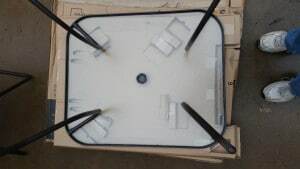 Do not throw away the inner box without taking the red box out of the corner, as this contains the brackets for the shelf to attach to the legs. Tools need for assembly are just a Phillips Screwdriver, the Allen wrench and Nut wrench are included in kit. Do not discard the red box in the corner, as this contains the brackets for the legs and shelf. The chairs are strapped together in pairs with plastic straps, you will need a pair of scissors or knife to unwrap. I opened the box and slid all of the contents out the end. I unstrapped the chairs and then laid the table top upside down on the cardboard box, as I was assembling on a concrete patio and did not want to scratch the finish. I inserted the four legs into the mounting flanges on the table top. 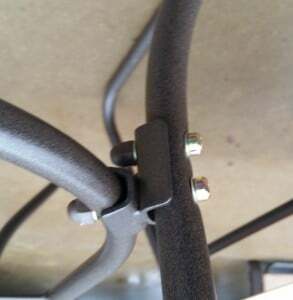 I loosely secured the shelf bracket to the each of the legs with the shorter Allen screw, two washers and a nut. I then loosely secured the shelf with the longer Allen screw, two washers and a nut at each corner. I turned the table over and placed on the concrete patio to tighten the screws and nuts. With it standing on its legs I felt that it would be level when finished. 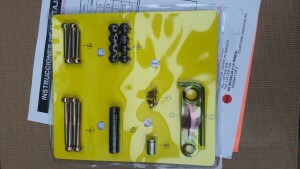 Each of the Allen screws have a plastic cap to cover the head when finished with installation. I then inserted the four Phillips screws a the corner where the legs meet the table top. When done the table felt very stable. In ten minutes I was ready to use my table and chairs. Because it is under an awning I did not install the umbrella at this time. It is stated by other customers to get a good umbrella stand to keep this table upright during high winds. When finished I did have three of the washers left over. I double checked and I had installed all of them. This is the easiest part to lose, maybe they give you some extra because of this. Mild soap and water is all that is required for keeping this set looking like new. Do not use any bleach or strong detergent as it will fade the fabric. I placed my folded chairs on their sides when storing them wet. As I will be storing this set in a shed when not used the chairs will fold up and be stacked on top of the table when not in use. I have a cover to keep the dust and some animals off of the top when in storage. This is the perfect set for a small patio or balcony. You can store the chairs easily when not in use. The Six piece Searcy Creek Mainstays Outdoor Dining Set is going to be a great addition to my Lake property for weekends and vacations. I hope that you have found this post informing and if you have any questions or comments use the form below. Please use the share buttons to let your friend know about this nice little dining set that does not cost an arm and a leg. You state that no umbrella stand is included. This may seem to be a really dumb question, but does it include the umbrella? Also do you know the price range of this set? I really like this small mainstay outdoor dining set, but have been looking for a great price on one. 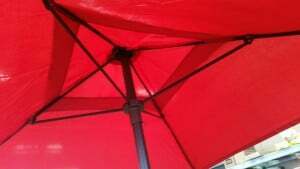 It does include the umbrella, I do not have it in the pictures as I have the table under an awning. The price is the same for both colors at the time of the post it is $96. Not a bad price! Do they come in other colors? This is perfect for my small backyard. At this time they only come in the vivid red and tan colors. The fabric is the only thing that changes color, as all the metal parts are the same powder coated color. This set is perfect for those small outdoor spaces. For someone who likes to travel and has little space to store a patio set this seems like the perfect solution. Everything is foldable so it can be stored away and comes in a great fun color, and looks easy to clean and maintain. And reasonably priced too! Something for me to think about purchasing for this summer when I go on the road. The table does not fold, you can easily take it apart to put in a small area to travel and reassemble. It only takes about 5 minutes to put the table together. This set is perfect for traveling or just a small space. You can store it out of the way without taking up a lot of space. The Umbrella is not real big, just enough to keep your table covered. I like the look of this outdoor set and at $96 it seems to be pretty good value. My only question concerns assembling it. Some of these self-assembly products are not as user-friendly as they could be and I’ve come across stuff where holes don’t line up and parts don’t fit too well. Did you have any problems putting this dining set together? You say you managed it in 10mins, but I get the impression that you’re fairly good with your hands. Could a dummy like me put it together without having a nervous breakdown? This was not a problem for me to put together, you only have to assemble the table. 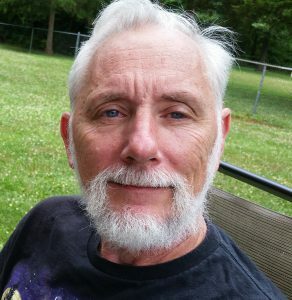 I just followed the simple instructions and did one step at a time. If you would follow the steps I did you also can put this together in 10 minutes, no nervous breakdown. I did not have any problems with alignment of holes on this set. I have in the past with other metal tables. It is so easy to assemble, I would take it apart to store it for long term and reassemble when I needed it. 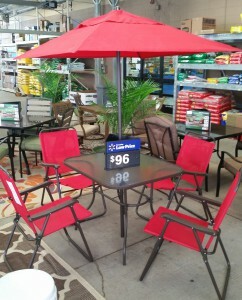 This patio set seems really nice and the perfect size for my patio. The chairs are nice looking but the only downside I can think of is that the weight limit is only 200 pounds because I have some bigger friends I like to hang out with and these chairs wouldn’t accommodate them. The umbrella will be very useful on super hot summer days. The one thing I don’t like is that their is no umbrella stand because it gets really windy at times and I want the umbrella to stay in place. For the price it is a great set. Getting an umbrella stand that fits your decor and wind conditions will be advantageous. Id did do a post on umbrella stands, you can look at what will work for you. Can I just purchase the chairs individually? At this time it is only offered in a set. Contacting the vendor will see if they can send replacement chairs.